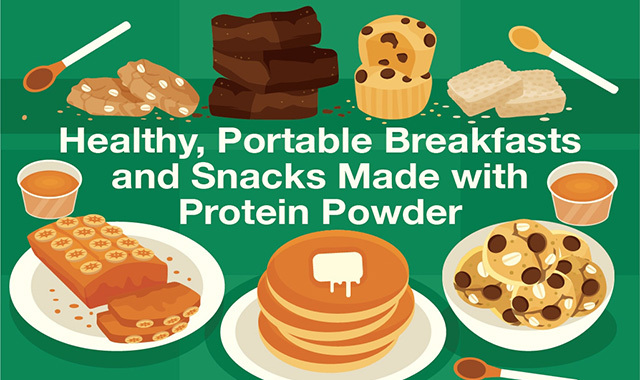 Healthy portable breakfasts and snacks made with protein powder #infographic ~ Visualistan '+g+"
If you’re a frequent breakfast skipper and/or you make more vending machine runs than you’d like to admit (M&M’s are a healthy snack, right?) then we’re here to help. While it’s easy to trade in breakfast for extra sleep, you can kill two birds with one stone by whipping up quick, easy, make-ahead recipes that double as nutritious snacks. And for breakfasts and snacks that give you staying power—and stave off hunger pangs—protein snacks are your number one friend. Though foods that are naturally high in protein are your best bet, it’s not always practical to travel with a bunch of hard boiled eggs or baked chicken breasts. Instead, protein powder is a great tool that you can mix and bake into healthy recipes like muffins, puddings, energy bites, pancakes, breads, and more. Read on for simple, healthy protein powder recipes you can eat at home or take to work.